This is a sweet, fun story about an unlikely relationship between a famous horror author and a symphony cellist. I admit that I may have watched too many episodes of Castle, but I really struggled to untangle Reese Kelsey from Richard Castle in my head. Which isn’t necessarily a bad thing. There are lots of similarities between the two famous writers, but Reese is a more serious character and his story is more drama than comedy. He’s a fairly tortured artist who struggles to live with the dark characters he writes in his horror stories. I really enjoyed the discussions and thoughts about his writing process. I think Owen is probably younger than Reese, but the cellist feels more balanced and adult than the author. I loved Owen from the start and the more I learned about his background, his friends, and his music, the more I loved him. Together, I loved the way Reese and Owen complement each other. I love their shared creativity and the way they support each other’s creative processes. Their relationship moves from hook-up to partnership at light speed, but it works because it feels natural and almost fated. My one reservation with this novel is Reese’s relationship with his friends. His offhanded comments about straight people and ‘breeders’ feel tasteless and not at all inclusive. His friends read as generic camp queens and together they reinforce every outdated stereotype of gay men. A couple of these scenes really didn’t work for me. Overall, I really enjoyed this story. Reese and Owen are a great couple and I loved their passions and their interactions with each other. Jodi Payne is a new author for me and I really love her writing style. I’m definitely going to be reading through some of her other stories and looking out for new ones in the future. This is a sweet story. Owen is a cellist who just was able to realize one of his dreams – he now plays for a symphony. He is talented and sweet, kind and gentle. He seems incredibly mature, even though we never really get his age. I really liked how he was kind and gentle, but wasn't a doormat. I also loved that he was unwilling to give up his college/conservatory friends for the "new job" that he had. Reese is a successful thriller writer and he is easily caught up in his work. He has had a string of bad relationships and even though he knows that it's a lot of his own doing, he can't seem to figure out how to fix his own concentration and ability when it comes to juggling both a relationship and writing. These two creative minds meld in a very romantic way. There is a little angst and a lot of chemistry. I do wish that the friends that both of these characters had were less stereotypical. I think it would have made the characters more well rounded. Overall, this was a great story and I enjoyed reading about them. I also am very interested in how Reese's next book goes. 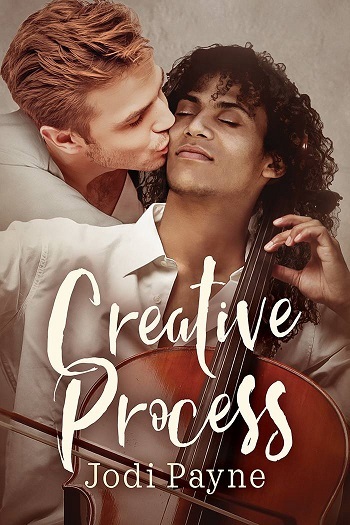 Reviewers on the Wicked Reads Review Team were provided a free copy of Creative Process by Jodi Payne to read and review. I'd rather date an author (free books!). I actually am married to a writer (although he doesn't write fiction/books). Authors are quiet, which suits me, but I also love music, so a musician could be nice. I would have to like his music though. Probably an author we'd have a lot in common and of course I would have first look at their stories. That's a tough call. I don't think it would matter so much whether they were a writer or musician. It would depend on how their mood/personalities changes when they are creating, and if I could handle being around them! I would prefer a author. Musicians tend to need to travel more depending on the type of musician. Either, they are both artists in my opinion. I would rather date a musician. I don't discriminate based on vocation. I'd date either.